Proximity effect is what happens when a microphone is held too close to a sound source, amplifying the low frequencies that might otherwise go unheard. The amplification of these imperceptible sounds is the focus of Erín Moure’s work. She is at once a receiver and producer of sound; her work is that inner ear which listens to the organs’ noise. In Moure’s own words: “[t]he body itself is an instrument for the voice.” Moure is the microphone, the amplification for those noises that exist undetected. 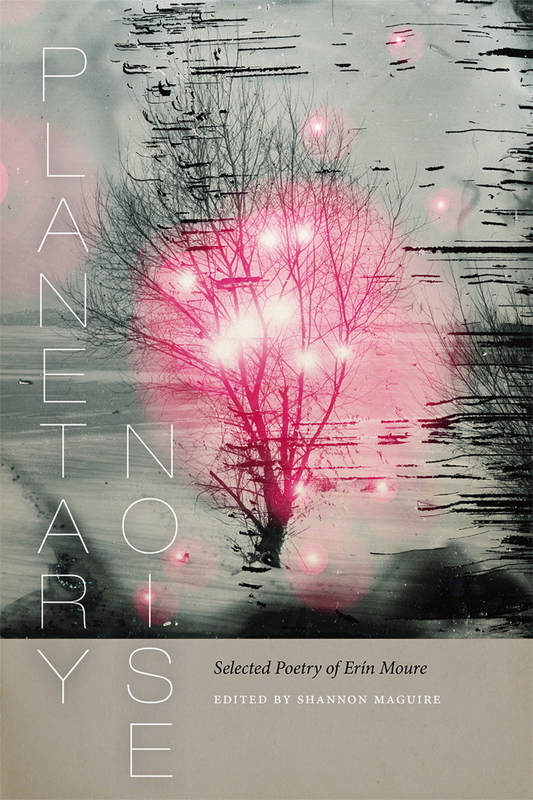 Shannon Maguire’s Planetary Noise untangles a vast network of Moure’s work that often playfully avoids convergence. She finds succinct waves of sound in Planetary Noise to loop and link words and images, creating thematically endless structures. Sound is cultural context for Moure: “we can’t speak about sound without admitting the presence of the speaker, that socially structured being who enacts it” (My Beloved Wager). If Moure seems difficult to pin down, it is because her work is more conducive to analysis through electroacoustics. This form of analysis is precisely what Maguire enacts in Planetary Noise. The chapters are divided into cycles which can be read as shifts of frequencies in the poet’s life. Once in the poems, you will find them occupied by the plural-bodied and untethered singularity of those who refuse to be subjugated. In an interview with Charles Bernstein, Moure notes that “every reading is a translation.” The body becomes a processing agent for words to travel through her synapses. Every reading of her work is a folding and unfolding. As a coding agent that codes back to the machine (see Pillage Laude), to any convergent master narrative, Moure uses translation as an agent between the surface and words, as set out in “the Acts”, which are “the precursor to her poetics” (Maguire). Translation is that agent that allows Moure to break through the surface of the poem, that surface with its linguistic representations, to the signal floor beneath the high frequency of semiotic rattle. If, as Bernstein points out, there is “the inability to be lost if you are in a dialogue,” it is because Moure’s translations function as a lyrical dialogue, allowing voices and bodies to speak back to one another. If translation is constructing dialogue between languages, Moure has included diverse frequencies and voices into the poems. Moure challenges consignation in part by her insistence on occupying the space of the page, those gaps between the lines and letters. The semiotic “gaps” which, by resistance, tremble and reverberate with desire. Those gaps which are access points for Moure, letters like arrays aligned for a re-processing. With this, in the pursuit of the boundaries of language and the amplification of those inaudible voices, her poetry has become its own feedback system, the proximity effect of getting too close to the source. If Moure seeks to resist categorization and paradigms, Planetary Noise embraces that resistance. Maguire has created a dialogue with Moure which challenges our impossibilities; a conversation which enables us to fold out with each other and into Moure’s work.